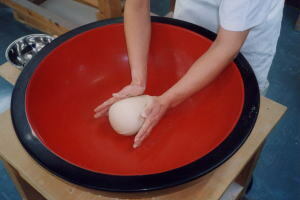 Push dough against the kneading bowl by palms of hands and make lumps of dough as large as ping-pong balls. 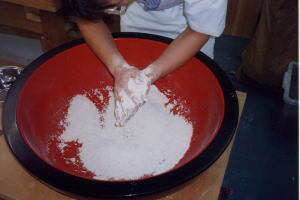 Get each dough like balls together,knead it with palms of hands and push it against the kneading bowl grinding it down until the surface of dough becomes glossy. 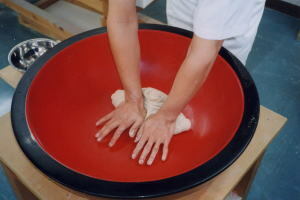 Fold kneaded dough in the inner part of the bowl and make more smooth dough. 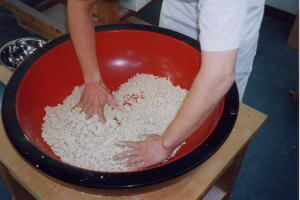 Pushing it out with palms of hands,release air from little air holes what is called the navel which has sprung by former chrysanthemum rub. 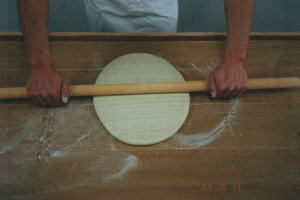 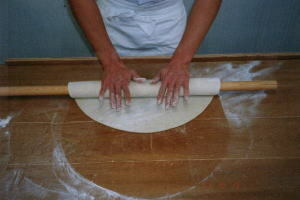 Make a size larger dough than the one which has been shaped round by means of pressing down with a rolling pin. 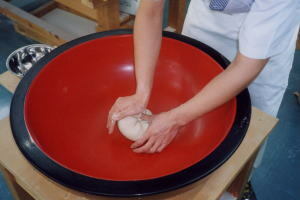 To make it round shape,remove from the kneading bowl and put dough on the kneading stand and fold it into a circle by palms of hands. 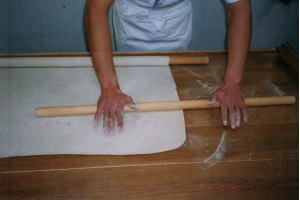 Wind the round shaped dough in rolling pin from your way forwards one end and make four corners of dough by pressing and rolling. 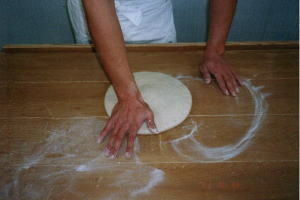 Wind and press dough with a rolling pin from all quarters and make it a regular (perfect)square. 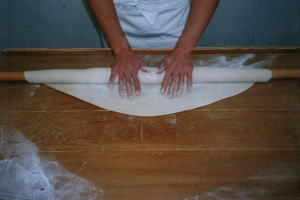 Flatten out the square dough equally when a part of dough doesn`t have the same thickness. 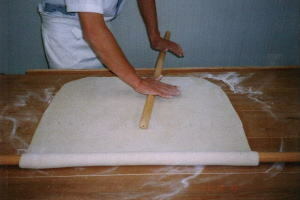 Flatten out the dough which has already finished rough flattening more evenly with rolling pin. 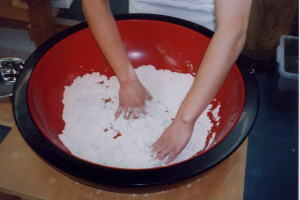 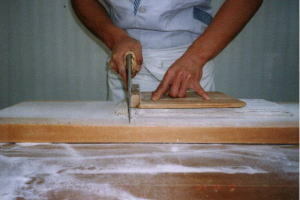 Gently lift and sweep away flour stuck on strips, then place soba into a vessel. 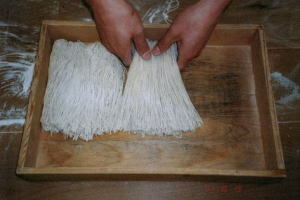 At last homemaking soba is completed.